with a dielectric coating on the hypotenuse of one prism. No optical cement in the interface. Suitable for high power. s-polarized light reflected at 90 deg..
High extinction ratio (> 500:1) over specified range of wavelength. 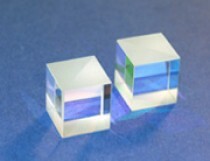 Reflectance of S-polarization: Rs > 99%.